This extremely rare bird is half female & half male. Now it has a boyfriend. An incredibly rare wild Cardinal was spotted in Pennsylvania after bird watchers noticed it’s distinctive plumage. While males are normally bright red and females a duller brown or yellow, this bilateral gynandromorphic bird is split down the middle – half female and half male. The cardinal was spotted and photographed by Jeffery and Shirley Caldwell in Erie, Pennsylvania. “Never did we ever think we would see something like this in all the years we’ve been feeding,” Shirley Caldwell told National Geographic. “Cardinals are one of the most well-known sexually dimorphic birds in North America—their bright red plumage in males is iconic—so people easily notice when they look different,” Daniel Hooper, a postdoctoral fellow at the Cornell Lab of Ornithology, told the magazine. 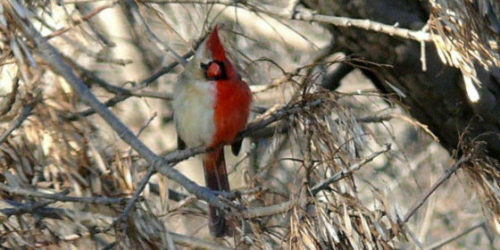 While most bilateral gynandromorphic birds are unable to reproduce, the beautiful Cardinal may be capable, Hooper says. The Caldwells are holding out hope. Shirley Caldwell says the unusual avian has a boyfriend. It usually spotted in the company of a male.